Fashion clothes always attract attention. We are inspired by runways season after season, search for trendy cuts and shades, create incredible outfits. And one of the very important things is the choice of accessories. They can make your look impressive and add a stylish touch to the basic wardrobe. 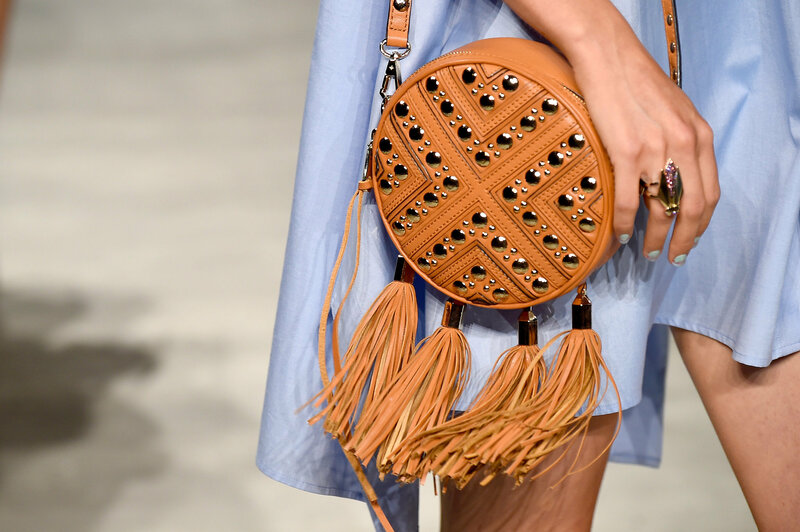 We have determined several accessory trends, which will be on top this spring. Do you know how to create an interesting outfit or how to combine various pieces? We will tell you about the latest tendencies and the most interesting collections by fashion designers. Every Fashion week we see floral prints and other flowery motifs in various collections. This year is no exception, but it has taken a different form. 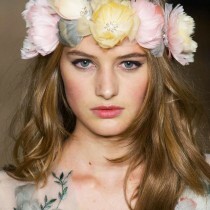 Beautiful headpieces with blossomed flowers are on top in spring 2015. 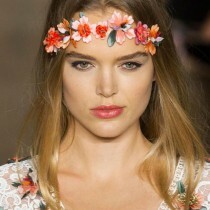 Fashion designers have made the headbands beautiful and fresh. Bora Aksu has combined blue and white, crochet and sheer materials. Marchesa designers Keren and Georgina have crafted glorious floral crowns, adding pastel feathers and elegant crystals there to add some bohemian touch to the collection and to soften rather bright make-up. 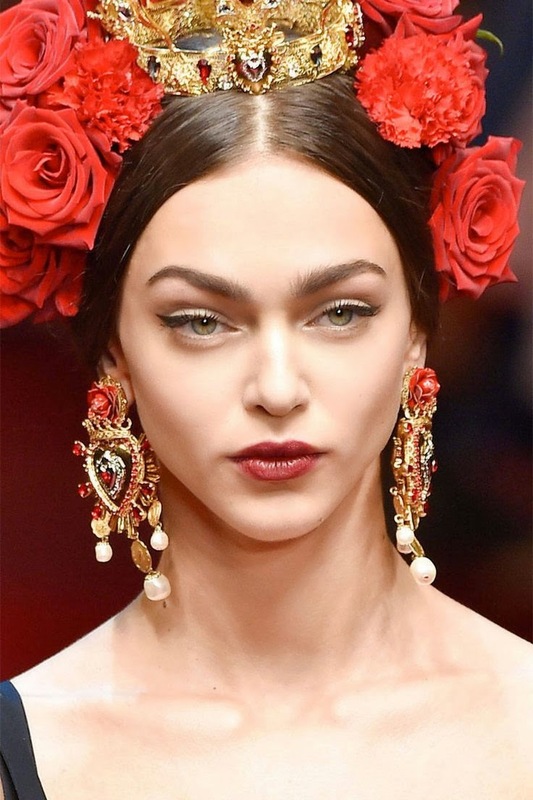 Dolce & Gabbana brand has been inspired by Spanish women. They have pinned carnations and roses in the models’ stylish buns. Fresh flowers have added effortlessness and sense of airiness to the sleek looks and can be easily translated to the real life. There are so many variants of this accessory. This season search for unusual styles like chokers, amazing pendants, gemstone bibs and half-moon necklaces to be on top. 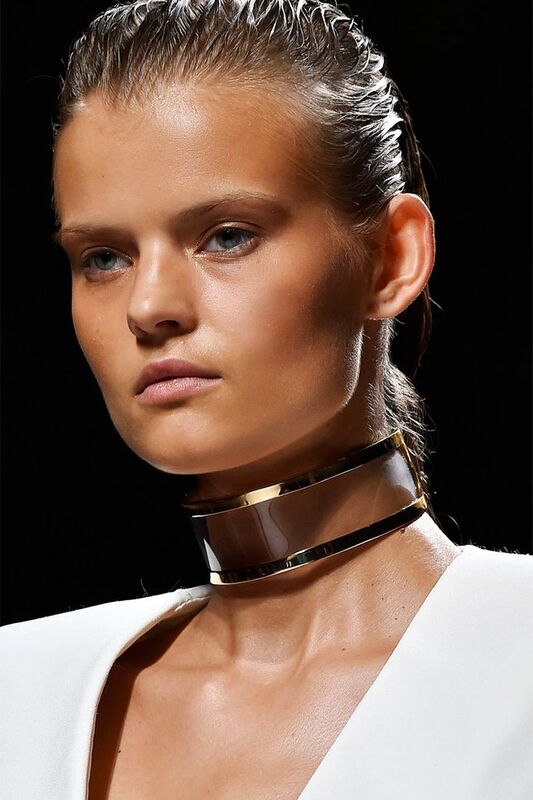 The tight embrace of chokers can add a chick element to the modern and fashion wardrobe. Such necklace can be made of heavy metals and be adorned with gems. Some designers offer the chokers in different colours or with matching prints. Search for this accessory in the collections by DKNY, Balmain, Christian Dior, Chanel, Givenchy, Lanvin, J.W.Anderson, Versace, Ralph Lauren. 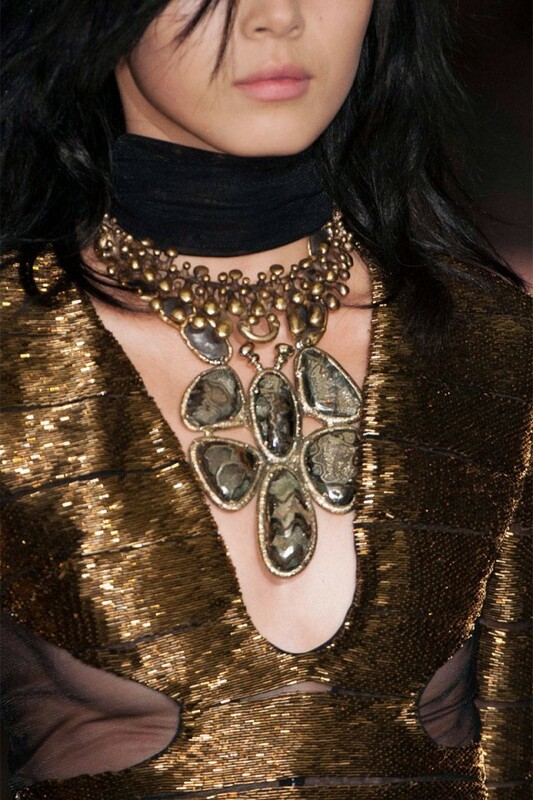 Half-moon necklaces can help you in creating a lush-polished look. Oscar Metsavaht has combined nature, art and architecture in this unusual accessory. If you want to look interesting and fresh, wear neutral clothes and add such wonderful necklace. Search for the Osklen line. Sporty and casual clothes will be very trendy in spring 2015. They are very comfortable and fit active people. 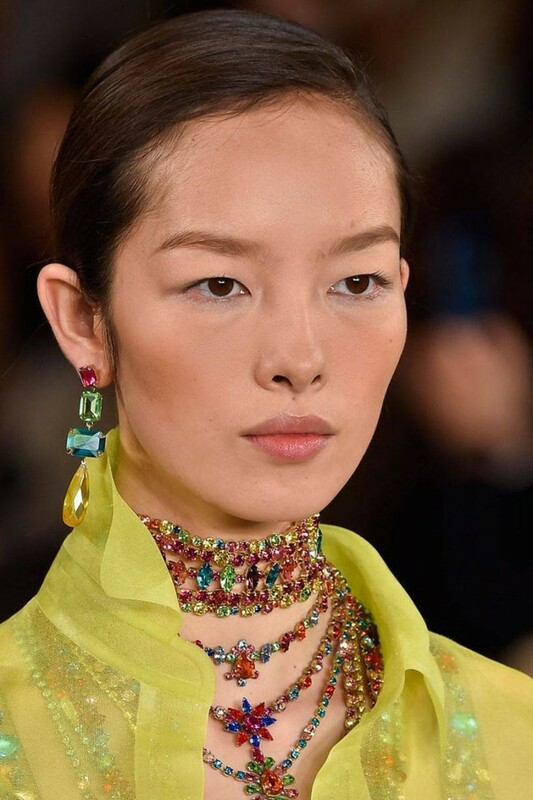 Ralph Lauren has created oversized gemstone necklaces to dress up the downplayed outfits. Pendant necklaces can make your spring wardrobe stylish and fashion. You can update your basics just adding this swinging accessory. Look for the collections by Derek Lam, Celine, Hermes, Edun, Nina Ricci and Lanvin. On the fashion runways we have seen lots of colourful bags, which for sure will be very popular among fashionistas in the upcoming spring. To look trendy choose round shapes, bright colours or innovative details. Burberry offers multicoloured top-handled satchels which match your outfits. Matching colours is one of the main trend of the next season. Rebecca Minkoff has created a collection of feminine round bags which fringe and various embellishment. And any of these handbags will be a great addition to any look. This trend is for confident people who like experiments. Do you remember a single-earring trend, which has been on top recently? It has given the way to the new tendency – unbalanced look. What does it mean? Irregularity is on top – whether it can be a different length, shape or colour. 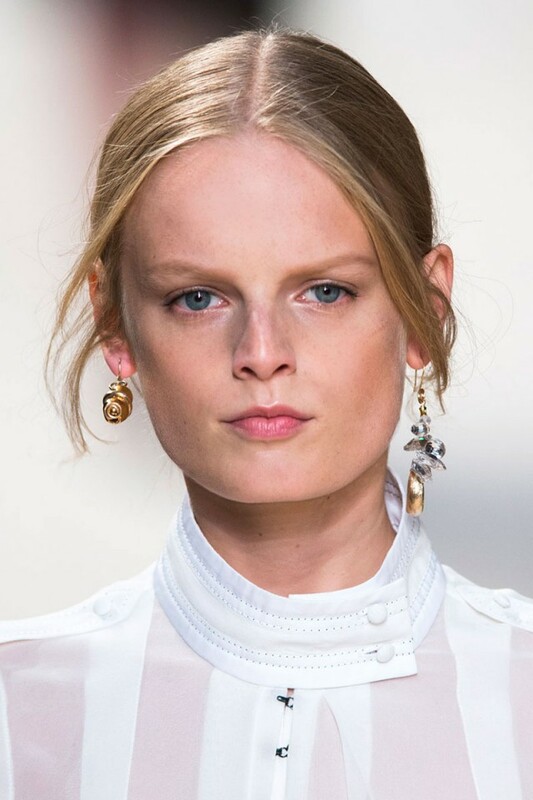 Search for the earrings by Hermes, Oscar de la Renta, Louis Vuitton and Nina Ricci. They all are different but look amazing and fresh. Every season we try to find the accessories of certain materials. The trendy metal of this spring is rich bold brass. It can be found in a huge variety of beautiful pieces like pendants, earrings, rings and necklaces. Choose collections by Lanvin, Dries Van Noten, Nina Ricci, Tom Ford, Loewe, Jason Wu and Valentino. On the runways we have seen lots of fresh and futuristic styles of sunglasses. Zac Posen offers the oversized frames with sun-glasses shapes to add a new edge to his feminine collection. Michael Korshas combined two popular styles – the aviators and the cat-eyes – to create a playful girly vibe. Suno has designed playful sunglasses in the variety of fun colours, and when warm season comes, choose colourful and fresh sunglasses styles to look playful and trendy. Figure-flattering silhouettes are very popular this spring. To create such feminine look fashion designers offer to cinch the waist with colourful tied belts. It’s one of the easiest accessory and can be applied to different pieces of clothes. BCBG Max Azria has created flowy silhouettes with beautiful belts to create feminine curves. Burberry also has added tied colourful fabrics in the spring collection. David Tiale has made a neutral collection and emphasized the waistline by adding colours with bright tied belts. Springtime is perfect for making experiments. Accessories can help you to change your look every day with minimum effort. Try various mixtures and colour combinations and you will look different every time. Be beautiful and stylish.